Today, as part of their Gold Box Deal of the Day, Amazon has got up to 50% off select Fossil watches, bags, wallets and accessories. 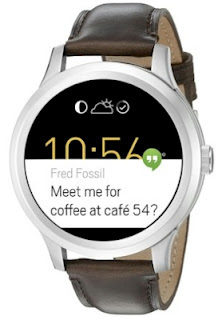 The best deal of the bunch (in my opinion) is on this Fossil Q Founder Gen 1 Touchscreen Brown Leather Smartwatch pictured at the top of this post is only $154.99 with free Prime/SuperSaver shipping, the lowest recorded Amazon price on this watch (normally averages about $214.00 on Amazon). FYI, this is the men's watch; the women's watch is over here. It got 4 out of 5 stars over 61 customer reviews. Great price on a nice looking smartwatch. The 50% off Fossil sale disappears at midnight Pacific time, so get your deals asap.